Formally a statutory committee of Her Majesty’s Most Honourable Privy Council, the Judicial Committee consists of senior judges who are Privy Councillors: they are predominantly Justices of the Supreme Court of the United Kingdom and senior judges from the Commonwealth. It is often referred to as the Privy Council. In Commonwealth realms, appeals are nominally made to “Her Majesty in Council” (i.e. the British monarch as formally advised by her Privy Counsellors), who then refers the case to the Judicial Committee for “advice”, while in Commonwealth republics retaining the JCPC as their final court of appeal, appeals are made directly to the Judicial Committee itself. In the case of Brunei, appeals are made to the Sultan of Brunei, who then refers the case to the Judicial Committee for advice. The panel of judges (typically five in number) hearing a particular case is known as “the Board”. The “report” of the Board is always accepted by the Queen in Council as judgment. The origins of the Judicial Committee of the Privy Council can be traced back to the curia regis, or royal council. In theory, the King was the fount of justice, and petitions for redress of wrongs arising from his courts were addressed to him. That power was gradually taken over by Parliament (which evolved out of the curia regis) within England, but the King-in-Council (which also evolved out of the curia regis) retained jurisdiction to hear petitions from the King’s non-English possessions, such as the Channel Islands and, later on, from England’s colonies. In 1833, at the instigation of Lord Brougham, the Lord Chancellor, Parliament passed the . The Act established a statutory committee of the Privy Council, known as The Judicial Committee of the Privy Council, to hear appeals to the King-in-Council. In addition to colonial appeals, later legislation gave the Judicial Committee appellate jurisdiction over a range of miscellaneous matters, such as patents, ecclesiastical matters, and prize suits. At its height, the Judicial Committee was said to be the court of final appeal for over a quarter of the world. Additionally, the government may (through the Queen) refer any issue to the committee for “consideration and report” under section 4 of the Judicial Committee Act 1833. The Judicial Committee of the Privy Council is the Court of Final Appeal for the Church of England. It hears appeals from the Arches Court of Canterbury and the Chancery Court of York, except on matters of doctrine, ritual or ceremony, which go to the Court for Ecclesiastical Causes Reserved. By the and the Appellate Jurisdiction Act 1876 all archbishops and bishops of the Church of England became eligible to be members of the Judicial Committee. The Crown Dependencies of Jersey, Guernsey (including Guernsey’s own dependencies of Alderney and Sark), and appeals from the Staff of Government Division on the Isle of Man. The United Kingdom’s Sovereign Base Areas of Akrotiri and Dhekelia, in Cyprus. Guyana 1970 Privy Council (Termination of Appeals) Act 1970 Court of Appeal Since 2005 the Caribbean Court of Justice hears appeals from Guyana’s Court of Appeal. The Gambia 1998 1997 Constitution of the Gambia Supreme Court of the Gambia A restructure of the Gambian judiciary by Yahya Jammeh, which made the Supreme Court of The Gambia the highest court instead of being below the as was the case under the . The bulk of the Committee’s work is done by the Supreme Court Justices, who are paid to work full-time in both the Supreme Court and the Privy Council. Overseas judges may not sit when certain UK domestic matters are being heard, but will often sit when appeals from their own countries are being heard. Most appeals to the Judicial Committee of the Privy Council are formally appeals to “Her Majesty in Council”. Appeals from Brunei are formally to the Sultan and Yang di-Pertuan, while appeals from republics within the Commonwealth are directly to the Judicial Committee. Appeals are generally by leave of the local Court of Appeal, although the Judicial Committee retains discretionary power to grant leave to appeal as well. After hearing an appeal, the panel of judges which heard the case (known as “the Board”) issues its decision in writing. For appeals to Her Majesty in Council, the decision is framed in the form of advice to Her Majesty, which is inevitably followed and given effect by being embodied in an Order in Council. Formerly, the Judicial Committee could only give a unanimous report, but since the Judicial Committee (Dissenting Opinions) Order 1966, dissenting opinions have been allowed. The Judicial Committee of the Privy Council is based in London. From its establishment to 2009, it mainly met in the Privy Council Chamber in Downing Street, although increase in the Judicial Committee’s business in the twentieth century required it to sit simultaneously in several panels, which met elsewhere. The Chamber, designed by John Soane, was often criticised for its interior design, and was extensively remodelled in 1845 by Sir Charles Barry. On 1 October 2009, the Judicial Committee moved to the former Middlesex Guildhall building, which had been refurbished in 2007 to provide a home for both the JCPC and the newly created Supreme Court of the United Kingdom. In this renovated building, Court 3 is used for Privy Council sittings. In 1901, the Constitution of Australia limited appeals from the new federal High Court of Australia to the Privy Council, by prohibiting appeals on constitutional matters unless leave is granted by the High Court on inter se questions. Appeals on non-constitutional matters were not prohibited, but the federal Parliament of Australia had the power to legislate to limit them. The right of appeal from federal courts (including territory supreme courts) was abolished through the Privy Council (Limitation of Appeals) Act 1968. Appeals from state courts, a continuation of the right to appeal decisions of colonial courts before 1901, continued, until they were also abolished by the Australia Act 1986, which was enacted by both the UK and Australian parliaments, on the request of all the state governments. The Australian Constitution retains the provision allowing the High Court of Australia to permit appeals to the Privy Council on inter se questions. However, the High Court has stated that it will not give such permission, that the jurisdiction to do so “has long since been spent”, and that it is obsolete. Canada created its own Supreme Court in 1875 and abolished appeals to the Privy Council in criminal cases in 1933. Despite this, some decisions by the Supreme Court of Canada went on to be appealed to the JCPC, including notably the Persons Case (Edwards v Canada (AG)), which established that women were “persons” under the British North America Act (Canada’s early Constitution) eligible to sit in the Senate of Canada. It also established what came to be known as the “living tree doctrine” in Canadian Constitutional law, which says that a constitution is organic and must be read in a broad and liberal manner so as to adapt it to changing times. … autonomous Communities within the British Empire, equal in status, in no way subordinate one to another in any aspect of their domestic or external affairs, though united by a common allegiance to the Crown, and freely associated as members of the British Commonwealth of Nations. 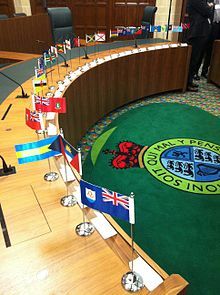 The nations of the Caribbean Community voted in 2001 to abolish the right of appeal to the Privy Council in favour of a Caribbean Court of Justice (CCJ). Some debate between member countries and also the Judicial Committee of the Privy Council had repeatedly delayed the court’s date of inauguration. As of 2005, Barbados replaced the process of appeals to Her Majesty in Council with the CCJ, which had then come into operation. The Republic of Guyana also enacted local legislation allowing the CCJ to have jurisdiction over their sovereign final court of appeals system. Belize acceded to the Appellate Jurisdiction of the CCJ on 1 June 2010. As it stands, a few other CARICOM states appear to be ready for the abolition of appeals to the Judicial Committee of the Privy Council in the immediate future. The government of Jamaica in particular had come close and attempted to abolish appeals to the Judicial Committee without the support of the opposition in Parliament; however, it was ruled by the Judicial Committee of the Privy Council that the procedure used in Jamaica to bypass the opposition was incorrect and unconstitutional. Another attempt will also be forthcoming. The then President of the Supreme Court of the United Kingdom, Lord Phillips of Worth Matravers, has voiced displeasure with Caribbean and other Commonwealth countries continuing to rely on the British JCPC. During an interview Lord Phillips was quoted by the Financial Times as saying that “‘in an ideal world’ Commonwealth countries—including those in the Caribbean—would stop using the Privy Council and set up their own final courts of appeal instead”. Sri Lanka, formerly Ceylon, abolished appeals to the Privy Council in 1972, on becoming a republic. Previously, the Privy Council had ruled in that it remained the highest court of appeal in Ceylon notwithstanding the country’s independence as a Dominion in 1948. The Gambia retained the right of appeal to the Judicial Committee of the Privy Council under the Gambia Independence Act 1964, even after The Gambia became a Commonwealth republic in April 1970 under Sir Dawda Jawara. Appeals were still taken to the J.C.P.C. from 1994 to 1998, when Yahya Jammeh, the then dictator and President of the Gambia decided to restructure the under the 1997 Constitution of the Gambia to replace the J.C.P.C. with the Supreme Court of the Gambia. Grenadian appeals to the Privy Council were temporarily abolished from 1979 until 1991, as a result of the Grenadian Revolution, which brought Prime Minister Maurice Bishop to power. was enacted to this effect. In 1985, Mitchell v DPP affirmed Grenada’s right to unilaterally abolish appeals to the Privy Council. In 1991, Grenada restored the JCPC’s jurisdiction. In 2016, there was a proposal in the Grenadian constitutional referendum, 2016 to terminate appeals from Grenada to the JCPC and to replace the JCPC with the Caribbean Court of Justice. This was rejected by a 56.73% majority, which means the JCPC remains Grenada’s highest court. Hong Kong’s court system changed following the transfer of sovereignty from the United Kingdom to China on 1 July 1997, with the Court of Final Appeal serving as the highest judicial authority of the Special Administrative Region (SAR). However, as confirmed by the Court of Appeal, decisions of the Privy Council before 1 July 1997 on appeals from Hong Kong “continue to be binding since the resumption of sovereignty on all courts of Hong Kong, save for the Court of Final Appeal”; i.e. these decisions remain part of the common law of Hong Kong unless and until overturned by the Court of Final Appeal. Pursuant to Article 158 of the Basic Law (the constitutional instrument of the SAR), the power of final interpretation of the Basic Law is vested not in the Court of Final Appeal of Hong Kong but in the Standing Committee of the National People’s Congress of China, which, unlike the Judicial Committee of the Privy Council, is a political body rather than an independent and impartial tribunal of last resort. In  the right of the Oireachtas to abolish appeals to the Privy Council was challenged as a violation of the 1921 Anglo-Irish Treaty. The then Attorney General for England and Wales (Sir Thomas Inskip) is reported to have warned the then Attorney-General of the Irish Free State (Conor Maguire) that the Irish Free State had no right to abolish appeals to the Privy Council. The Judicial Committee of the Privy Council itself ruled that the Irish Free State Government had that right under the Statute of Westminster 1931 (Imp.). In May 2015, the Jamaican House of Representatives approved with the necessary two-thirds majority bills to end legal appeals to the Judicial Committee of the Privy Council and make the Caribbean Court of Justice Jamaica’s final court of appeal. The reform will be debated by the Jamaican Senate; however, the government needed the support of at least one opposition Senator for the measures to be approved by the required two-thirds majority. The 2016 general election was called before the reforms could be brought to the Senate for a final vote. The Jamaican Labour Party, which opposed the changes, won the election and has promised to hold a referendum on the issue. Despite the coming into effect as a result of the Unilateral Declaration of Independence, appeals continued to be accepted by the Privy Council as late as 1969 due to the fact that under international law, Rhodesia remained a British colony until gaining its independence as Zimbabwe in April 1980. ^ “Role of the JCPC”. Judicial Committee of the Privy Council. Retrieved 31 January 2019. ^ “Willers v Joyce & Anor. UKSC 44” (PDF). The Supreme Court. Retrieved 23 July 2016. ^ “The Brunei (Appeals) Order 1989”. Retrieved 16 June 2011. ^ “Privy Council (Limitation of Appeals) Act 1968”. Federal Register of Legislation. ^ Poulter, Sebastian (November 1977). “No.8: Dual Marriages in Lesotho” (PDF). National University Of Lesotho, Faculty Of Social Sciences, Staff Seminar Papers. p. 3. Retrieved 17 April 2018. ^ Laughton, John Knox “Memoirs of the Life and Correspondence of Henry Reeve, C.B., D.C.L …, Volume 2”, p. 564. ^ “Election intelligence”. The Times (36059). London. 7 February 1900. p. 11. ^ Wall, Edgar G. (1903) “The British Empire yearbook”, London: Edward Stanford, p. 4. ^ “Dundee at War”. Archives Records and Artefacts at the University of Dundee. University of Dundee. Retrieved 22 December 2015. ^ Waters’s brother, Major Philip Duncan Joseph Waters, M.C., was the commander of the firing squad that executed Josef Jakobs, the last person executed in the Tower of London. Major P.D.J. Waters – Commander of the Firing Squad that Executed Josef Jakobs. Retrieved 6 May 2017. ^ “Executive Team”. Judicial Committee of the Privy Council. Retrieved 23 December 2017. ^ “Records of the High Court of Admiralty and colonial Vice-Admiralty courts”. National Archives. Retrieved 6 May 2017. ^ Bruce Clark (1990). Native Liberty, Crown Sovereignty. McGill-Queen’s University Press. ISBN 9780773507678. ^ “Bombshell ruling – Privy Council says passage of CCJ unconstitutional”. Jamaica Gleaner. Retrieved 16 June 2007. ^ “Privy Council Decision should not halt Caribbean Court”. Caribbean Net News. Archived from the original on 25 February 2006. Retrieved 16 June 2007. ^ “CCJ blow”. Jamaica Observer Newspaper. Archived from the original on 7 June 2007. Retrieved 16 June 2007. ^ Rohter, Larry (7 July 1997). “Death-Row Rule Sours Caribbean on Britain”. The New York Times. Retrieved 24 June 2009. ^ a b c “Moore -v- Attorney General of the Irish Free State”. Important Judgments. Dublin: Courts Service. Retrieved 2 November 2010. ^ “House of Representatives Votes For Jamaica To Leave The Privy Council for the CCJ”. The Gleaner. 12 May 2015. Retrieved 2 June 2015.